Saute the green onions in 2 tablespoons of butter until softened. Set aside. Melt the remaining butter. Brush 1 sheet of phyllo with the melted butter, place another sheet on top and brush with the butter, repeat with 3 more sheets (5 sheets in total). Cut the layered phyllo into 3 inch squares and push down each square into a mini muffin tin. Continue with the rest of the phyllo working with 5 sheets at a time. Place one piece of Teet’s Smoked Chicken Sausage in each cup. 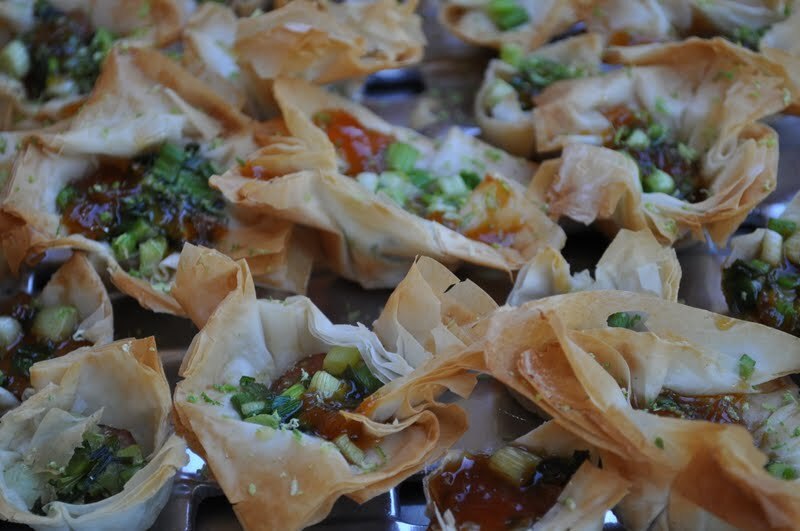 Top each one with a generous amount of the green onion mixture. Bake for 8-10 minutes. While the cups are baking, mix apricot preserves, soy sauce and lime juice in a small bowl. Once the cups are baked, drizzle them with the apricot mixture and sprinkle with lime zest. Enjoy. Note: While working with phyllo dough, keep the sheets you are not working with covered with plastic and a damp kitchen towel. You can usually find this information on the phyllo package.